With the release of huge wave of gadgets in the Philippines, SMART has come up to lower the price of iPad Mini plan, a impressive move by SMART to bring Filipinos affordable and yet Apple products. A device desired by many, but it is quite expensive when your purchase it by cold cash, while paying 999/month wouldn't hurt your pocket that much. Anyway, lets get a through-rough explanation on how to avail this great offer from SMART. Just simple go to the nearest SMART Centers nationwide, you can also navigate their page online using these url http://smart.com.ph/store. Or contact 8488877 on land-line phones, or call using cellphone by dialing *887 for SMART subscribers. What's included in Plan 999? 50 hours of internet connection per month. Up to 7.2 Mbps connection. The iPad Mini doesn't come free, a first time payment of Php1,500 and Php999 to avail the promo, which is available only to 16GB version, other versions will cost more per month, but that's another story. 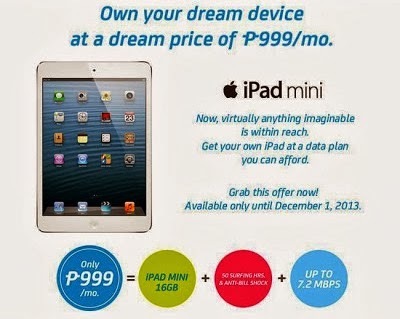 The SMART Bro All-in iPad Plan 999 is indeed a great opportunity if you really want to have an iPad. But mind this that exceeding the allocated hours of internet will incur additional charges which is P5 for every 15 minutes, and you'll be shocked on your next bill cycle. But don't worry since the maximum bill will be Php1,599 and the rest are unlimited. Nevertheless, the iPad Mini Plan 999 will not last that long, since promo period is only until December 1, 2013.